I actually finished this table last week, yet I managed to forget to post it to the blog. I finished a handful of other Renewals all around the same time and managed to post most of those…this one just slipped my mind. I didn’t slip anyone else’s though, as I received many compliments on it and had a couple people interested in buying it. Because I mostly sell off of Craigslist, I don’t “hold” furniture for anyone (have had far too many people call me and make appointments, even say “I’m on my way now,” and then never show up). Therefore, the first one to show up with cash in hand gets to buy it. Well the first person to show up was a wonderfully nice lady who was absolutely in love with this table and didn’t even try to haggle with the price like most people do. She paid me full asking price, no questions asked. I’m grateful for that! This lovely table is an antique, 1962, Heritage Furniture side table. Heritage Furniture is the Heritage in Drexel-Heritage, famous North Carolina furniture company. In 1957 Drexel Enterprises acquired the Heritage Furniture company and continued producing furniture under two separate named entities until they later dropped Heritage and combined the two into the well-known Drexel-Heritage furniture line. It was in fantastic shape when I acquired it…it was just boring. So I whipped up a batch of homemade chalk paint and went to work painting. She took 5 coats! Emerald is a lovely color and it is very labor intensive. After the paint dried, I glazed the whole thing with a deep brown glaze and then finished it with two coats of AS soft wax in clear. If only my house were bigger, this thing would still be sitting in my living room! Hope everyone has been having a wonderful start to their week. Happy May! How was your May day? Lemme tell you, here in Denver, we rung May in with style…8+ inches of snow style. Yeaaa, it was….splendid. I love the snow, I really do. Just not in May. I’m not complaining though, as I would much rather have a spring snowstorm (as long as I don’t have to shovel sidewalks) than a day where you wake up, it’s raining, and the rain doesn’t stop until after you go to bed. Had plenty of those days when I lived back East and I am NOT a fan of rain. It just makes everything so wet and…blah. But you know what is *not* blah?!? This beautiful table. Well it was blah…before my hands got to it anyways. So let’s get to it, shall we? Isn’t he stunning? Normally I would refer to the furniture as ‘she,’ though in this case, I felt The Bruno had a warm, masculine feel due to that rich black base and the warmth of the stained wood top. As you can see from the before photo, this table was pretty beat up when it came to the RPhD workshop. Not only was it beat up, it was also finished in this very blah reddish stain that nearly hides the intricate checkerboard oak wood inlay on the top. When it first came to us, the top was in pretty bad shape and at first glance I was thinking this was going to have to be a totally painted piece. As I started working on stripping and sanding the top, I realized I was going to be able to save the veneer inlay and that’s when the vision came together. I’ve always wanted to use multiple stains on a project and here was the perfect opportunity. Using two custom-blended stains and six other colors, I laid out the tape and got to work. I stained only the square inlays and left the other pieces natural so that they could take on the beautiful, gold-amber tones of the polyurethane topcoat. I could not be more pleased with the results. For the base, I knew I wanted to pair the warmth and richness of the stained wood with black. It’s a classic combination and has been very popular in design lately. So I used black, grey, and charcoal and used a dry-brushed, layering technique to add dimension and character to the paint. The result is this well-worn and muted look. After all, the legs and lines of the table are so beautiful that if we used any other color and finish, the legs would totally distract from the top, and with such a beautiful and unique top, we definitely don’t want that. As always, we protect and seal our furniture with durable and protective topcoat finishes. The painted base of this table is finished with a high-quality, waterproof wax and the top has 3 smooth coats of a super-durable polyurethane finish. While the polyurethane is very durable and 3 coats thick, it is always recommended to use coasters when placing glasses and mugs on furniture surfaces. The Bruno is 38 inches in diameter and 16 inches high. Please email Pelham at pelhamhebertdesigns@gmail.com in order to set up an appointment to view this lovely table in person. The Bruno is only available for pickup in the Denver area. We do not currently ship (though we are exploring options so that our fans outside of Colorado can enjoy a Renewal by Pelham of their own). Wow, has it really been a month since the last post? April has been soooo crazy and busy. And by busy, I mean that I’m taking an 8 week seminar that has me putting in 60+ hours at real estate each week. Between that and mother nature deciding to make April the snowiest month in Denver for the entire winter, there has been little time to focus on Renewals by Pelham Hebert Designs. When there was time, I had to resort to working on smaller projects in the cramped confines of my home office. Not exactly ideal. One of the main reasons that I love this little venture of mine is that it offers me a break from the ‘trapped indoors’ aspect of my primary career. When the weather is nice, like this past weekend, I have been known to shirk social responsibilities, avoid my friends, as well as the indoors, and spend nearly every minute from sun-up to sun-down outside in the workshop. Creating, imagining, breathing, living. Or, more accurately, sanding, painting, glazing, cramping, or otherwise getting sweaty and dirty in some way related to furniture re-purposing. To many people that sounds like the complete opposite of relaxing and stress-relieving. For me, there aren’t many things that are better at taking my mind off of the helter-skelter and stress of the rat-race we call career. But that’s when the weather is nice. This great, vintage, roll-top breadbox didn’t require much space…isn’t it freaking adorable? When I first got my hands on this old breadbox, all I could think about was how I have never, ever needed one. And how I knew absolutely no one else who has one. Something tells me both of these statements are going to be wrong very soon! Why? Because the Toto is awesome, duh. And it doesn’t have to be utilized to store fresh loaves of bread…I’m currently using it to store clutter and make my too-short-nightstand more functional by providing a surface at bed height to keep a glass of water on. A glass of water on a painted breadbox?!?! Sure, because I used a super-duper durable finishing wax on it that is waterproof and will protect the paint and surface from pretty much anything short of muriatic acid and gasoline. Don’t worry, the wax is organic and zero-VOC so it’s more than safe to store food in and won’t stink up your house! If I had more counter space in my kitchen this little thing probably wouldn’t even be up for sale because I love it and would totally find some use for it (fresh bread lasts about a half a day in my house before it is fanatically consumed by hungry mouths). Toto is 12 inches high by 17 inches wide and is 12 inches deep. Boy, March FLEW by. We’ve sold most of our available inventory (we just found a loving home for The Yorkshire today) and taken on a handful of custom orders, as well. The workshop is literally littered with a handful of ‘half done’ projects. They are ‘half done’ mostly because I have been extremely busy at work, AND also because Colorado’s late winter/early spring weather has returned to normal…that is to say, we’ve had two blizzards separated by near-70 degree days. In addition to the weather and work, I am currently renovating the only bathroom in my apartment. It currently has no walls, no sink, and no toilet…aaaaaaand hopefully it will all be put back together by this weekend. More on that later…. Despite all the melee, I did manage to put the finishing touches on one of those ‘half done’ projects: meet The Hartford! The Hartford is a lovely, curvaceous, little end table with beautiful rope detailing and classic claw feet. First, I painted it with a deep, rich teal, knowing that I wanted to achieve a multi-layered look when it was distressed. Then, I painted it with a shabby chic classic, pure white chalk paint. After the paint dried, it was time to moderately distressed it all over. 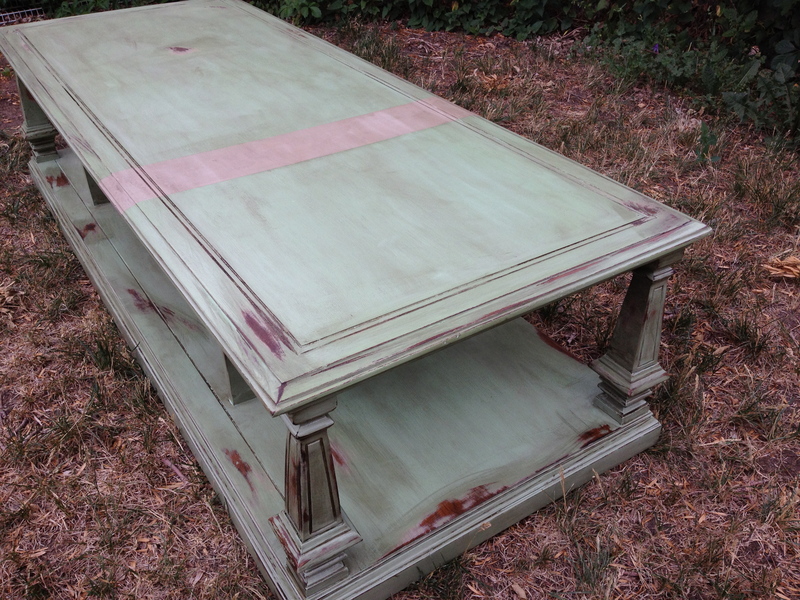 The end result is this classic, shabby chic look that has both teal and the original wood peaking through…. What do you think?? We have been so anxious to reveal The Yorkshire. She’s been done for over a week now. The delay is due to Mother Nature finally sending snow our way in Denver. We received close to 12 inches over the past week and, while snow melts quickly around here, the ground has been soaked and muddy. No more! The sun was out today and the temperature hit close to 60! So, this afternoon, we moved The Yorkshire into the staging area and waited for the sun to drop just enough to give us the perfect light that we love to photograph our work in. The Yorkshire came to us in pretty rough shape. Her previous owner must have never waxed or polished her original wood finish because the old varnish was flaking off like Goldmember’s skin. No, we did not eat it. Eww. We did sand it, though. Oh did we sand it. While sanding her, she started to speak to us and we started to envision her final look. The top was just begging for a rich, dark stain and we knew this custom blend, aqua green we made for a smaller project a while back would be perfect for the ridges and detailing on The Yorkshire. Once we painted, distressed, glazed, and waxed her, it was time to put the hardware back on. With all the original hardware painted white and distressed, to go along with the distressed edges on the dresser, we felt like she was lacking something. We found these wonderful pink glass knobs in our knobbery collection and as soon as we saw them on her, we fell in love. Shabby and glam. Bam! The Yorkshire is a classic 9 drawer dresser. She measures just under 6 feet long, about 2 and a half feet tall, and 20″ deep. Please contact us by email: pelhamhebertdesigns@gmail.com or through our facebook page for more info and to set up an appointment to see The Yorkshire or any of our other pieces in person. Thanks! We are so excited to share this latest Renewal with you. It is one of our favorite Renewals in the entirety of Pelham’s history of upcycling old, discarded furniture. When we found this little dresser it was in rough shape. 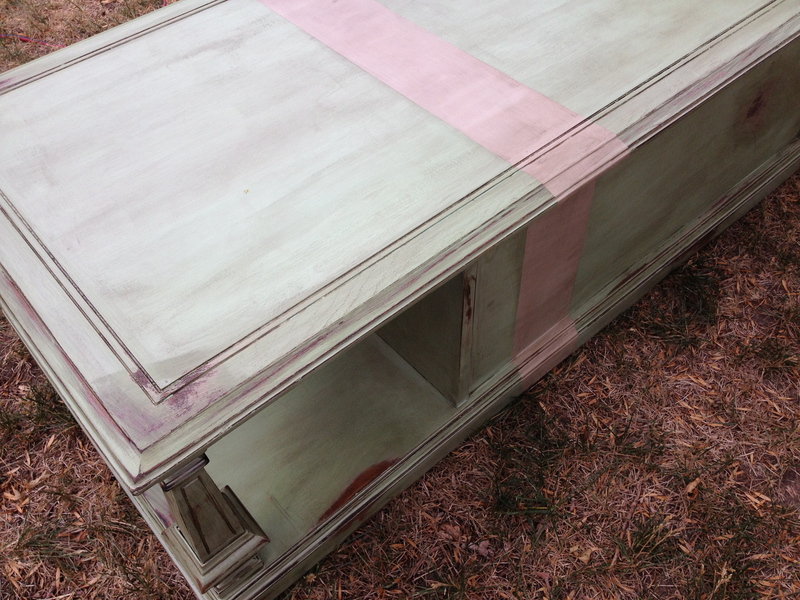 While it is hard to tell in the before pictures, I assure you, this dresser was absolutely caked in paint. It was like someone let a 5 year old put icing on the cake. The previous owners had painted this flat and dark red over EVERYTHING. The keyholes, the top, and the knobs too! Pelham knew immediately that he was going to have to pull out the heavy duty varnish stripper for this one. He started with the top and the drawer fronts. When he started stripping the top, he realized that the red was not the only coat of paint…no, no, no, no, no…there were FIVE different colors of paint before he finally found the absolutely beautiful wood grain hiding underneath it all. It was after he stripped the top that he knew where Old Red wanted to go (Pelham works organically, letting each piece of furniture determine it’s own Renewal and lead him in the right direction…this is why our Renewals often look very different from one another). Old Red, she wanted her old layers to be peeled back, left in place to tell her long, difficult history. So, Pelham obliged her and used a weathering technique to make the newly exposed wood grain top and drawers look their age. The outcome is absolutely stunning! Don’t you think? We can’t believe this beautiful wood was covered up! We already stripped the top before getting a “before” picture. In person, the red paint job was HORRIBLE and messy. In the playful nature of this charming dresser, we are offering you the option to customize the knob configuration. Choose any from the pictures, let us know, and we will have them installed and ready prior to pick-up or delivery. Our particular preference would be for the distressed yellow knobs on top, with the burlap knobs in the middle, and the green, glazed, ceramic knobs on the bottom drawer. The burlap just ties in well with the rustic and shabby feel of Old Red, the yellow gives it that eye-grabbing pop, and the green ceramics add a touch of class to the aging beauty. This item is located in downtown Denver. We can deliver to all Denver County zip codes, or the item can be picked up from our workshop in Congress Park. Please contact us by sending an email to pelhamhebertdesigns@gmail.com with all questions and any interest in purchasing Old Red or any of our other Renewals. Thanks. This OOAK (one-of-a-kind) beauty was inspired by vintage art posters that used standard block lettering to arrange well-known NYC subway station names against a black background. 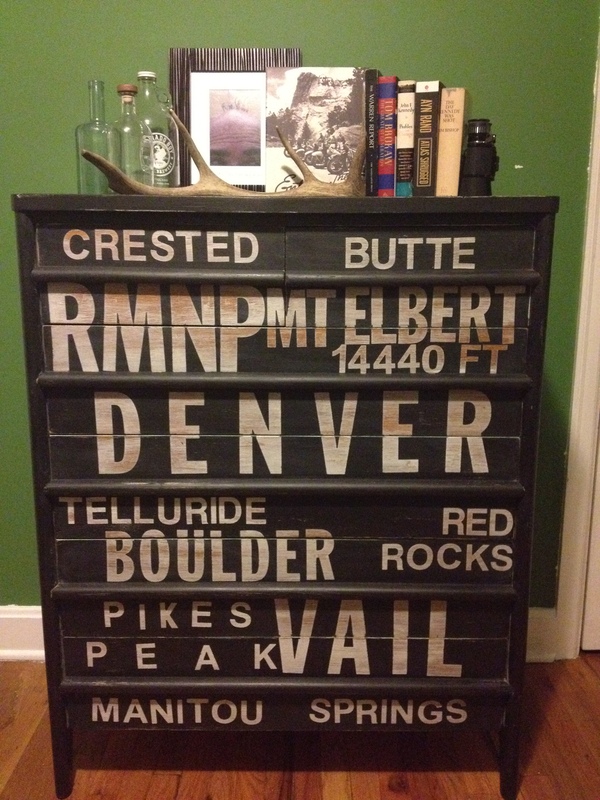 Pelham, being a lover of all things Colorado, knew he wanted to create a piece that paid homage to this wonderful home state of his. What better way to do it than replicating subway art??? What do you think? Is your favorite Colorado destination/landmark included? There are so many wonderful places in Colorado…it just wasn’t possible to include them all. This beautiful, 6-drawer, tall-boy had seen much better days when we acquired it. With the loving touch of the orbital sander, some skilled woodwork, and the labor of a paintbrush, the transformation was complete! The lettering was all done in a whitewash technique so that the original wood grain could peek through. The black is a deep, graphite color created by mixing two different paint colors and some homemade chalk paint. 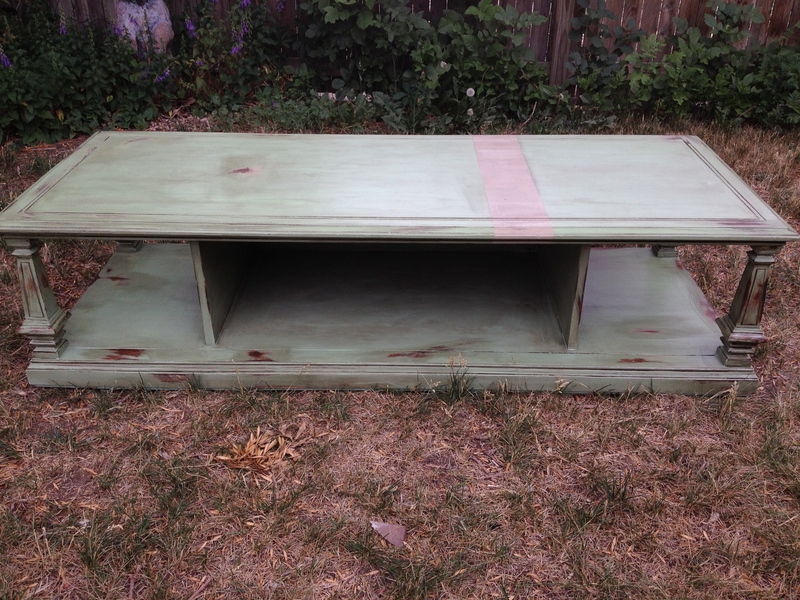 And the drawers’ insides were updated with a wonderful mint green color that reminds us of one of Colorado’s many alpine meadows in mid-summer. 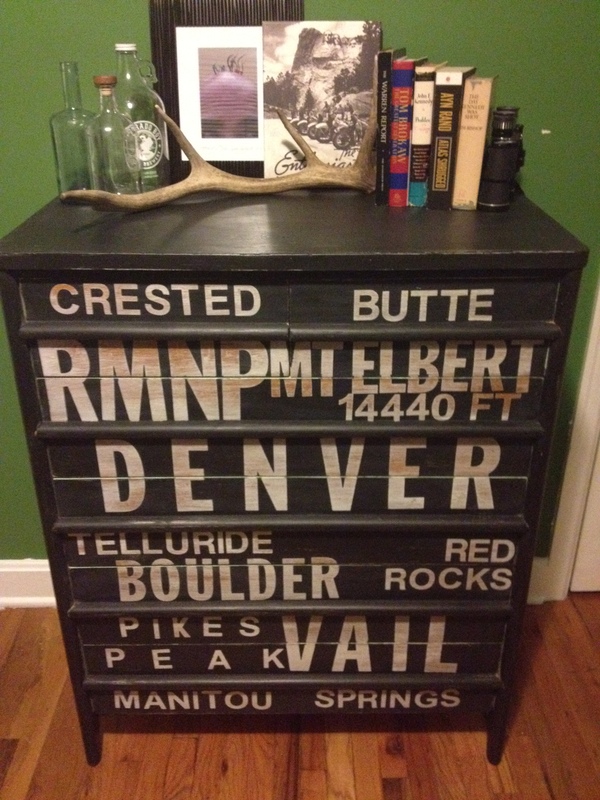 We were hoping to hold on to The Coloradan for a while, and use it as much needed storage in our library/home office….though, when we posted pictures of the Renewal on facebook, a friend of ours saw it and just had to have it, making us an offer we couldn’t refuse. Speaking of Facebook, please visit our Facebook page here and support us by “liking” us. The RPhD Facebook page is routinely updated with our inventory and other fun and interesting RPhD news. If you absolutely love this Renewal and would love to have something similar in your home, please contact us at pelhamhebertdesigns@gmail.com and we will be happy to discuss our custom options with you! This beautiful Renewal is The Seamus. It is a 1970s era clover-shaped end table with a storage cabinet. It has beautiful molding and great lines. This table was speaking to us from the moment we acquired it. There were only two color options we were considering: a deep, Chinese inspired red, or the deep aqua we ultimately went with. We just love all the aqua! After carefully painting this unique, clover-shaped table, we knew we wanted to give it a well-worn look using a black glaze. All those lines and molding were just begging for a heavy-handed glaze! After we were happy with the level of glazing, we found a beautiful oil-rubbed bronze hanging door pull to complete the look. We love it so much that we don’t want to sell it! It would look quite stunning next to our new distressed leather sofa. But then again, it will look just as stunning next to YOUR sofa! Or bed, or easy chair, or in your library. We think it is quite the deal at $125. Please contact us at pelhamhebertdesigns@gmail.com for more information or to purchase this exquisite table! We’ve been so busy in the workshop that we’ve not had time to put up the latest Renewals on the site here. Have a few coming your way so stay tuned. And now, let me introduce The Waterford. This beautiful square occasional table has been lightly distressed and has a beautifully aged and regal look to it. This wonderful table sits on 4 old wooden casters and has a single storage drawer. We wanted to preserve the vintage feel to this table so we used a beautiful walnut stain for the diamond wood-grain inlay on the top while glazing the aqua paint color with a deep walnut as well to add complex depth and that wonderful appearance of well-worn age. We love the way the color turned out! As for hardware, we found these beautiful glass knobs that shared the main colors of the table and had a very interesting design…we knew they would be perfect! What do you think? This stunning table would be perfect in your home and you can admire its beauty for years to come for only $145! We’ve been very busy around RPhD lately and will have numerous new products to bring you over the coming weeks. 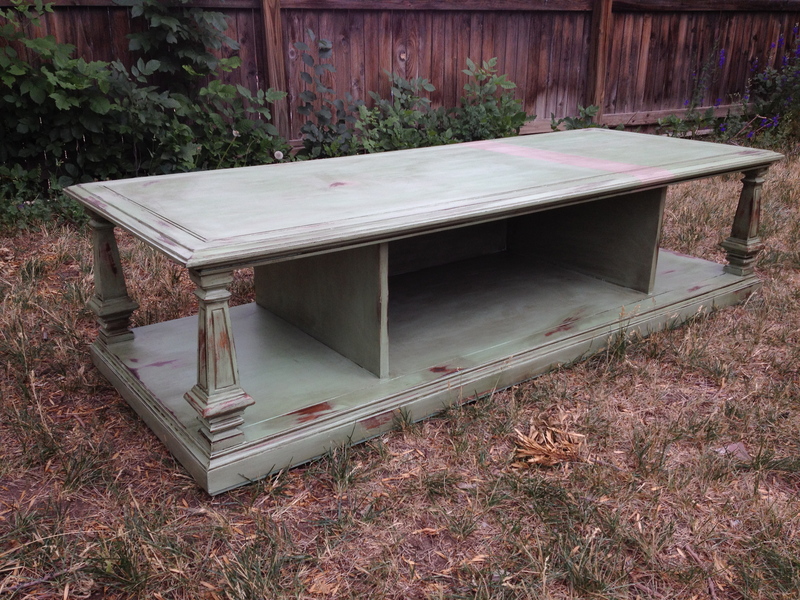 Our latest Renewal is a stunning and beautifully distressed coffee table that we posted about a few weeks ago. This wonderful coffee table has great form and function and the architectural posts gave us a lot to work with. We decided to use a beautiful mint green as the base and then added age and depth to the table by carefully glazing it with a warm chocolate brown. 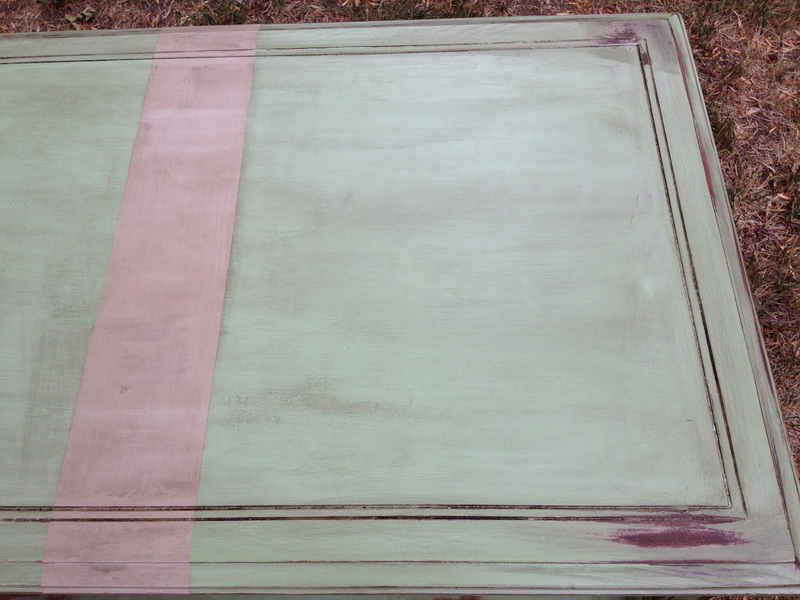 It is hand painted and distressed and has room for storage baskets or magazines underneath. This beautiful table is now in a loving home! Contact us if you’d like us to make a very similar Renewal just for you.